Well today marks and interesting milestone for me. As of today I have had my motorcycle license for four years. Nothing super important, but a neat little mile marker, and an excuse to pause for a sec and take stock. I write this as I embark upon the next major chapter in my life. A 2year+ journey down through Central and South America. I'm headlong into the planning and preparation stages of the trip, scheduled to leave Canada in a year's time. Definitely lots of hard work, earning, saving, planning and dedication ahead of me. But for the moment I'm glancing back in the rearview mirror. 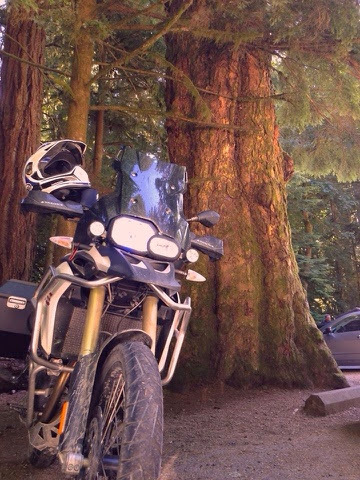 In the four years now that I've been riding I've purchased 2 bikes, logged over 85000km and have been all over North America. Including Prudhoe Bay Alaska, Inuvik North West Territories, across Canada, USA, and Baja California, Mexico. That works out to something like 59km per day since I've had my license. Not bad if you consider there was a life and a full time job in there as well. But peanuts compared to some of the travelers I know who are out there living it. None the less though, it's been an exciting and addicting adventure. Traveling and discovery is fuel for your soul and it inspires curiosity, independence and fulfillment. It breaks down complacency in day to day routine and replaces it with excitement, filling us with anticipation and tolerance for whatever may be around the next corner. We meet people that enlighten us, and inspire us, and it feeds our love for the human spirit. Interesting and random connections with strangers turn into sometimes lifelong friendships. The kindness and curiosity of people on the road is totally amazing to me. One second you're oiling your chain or grabbing a quick sandwich at a gas station, the next you're engaged in a full on conversation with someone about who knows what. It's the connections and human touch of the people we meet along the way that make the long paved highways or sketchy gravel mountain passes so much more beautiful. More often than not, a breakdown or a flat tire is more of a good thing than a bad. It's been a fun four years behinds the bars of a motorcycle. I'm in it for the long haul now that's for sure. And as I head south, the next four are sure to be some of the best of my life. Who knows where that road leads... I can only imagine. Pretty sure I'll need some more tire patches and chain oil though. It is so important in vehicles to have rear view mirror, It is best for safety of vehicles and become easy for the drivers to drive it safely. Buy the best product of Side Rear View Mirror on cachimirror.